Habit: Annual 5--42 cm. Stem: erect to decumbent, glabrous to hairy. Leaf: 1--11 cm, lower lobed, upper entire to lobed. Inflorescence: bracts lanceolate to ovate, 3-toothed to entire, green, occasionally +- white base, faint, small. Flower: sepals 1--5 mm; petals 2--7(8) mm, ovate to obovate, yellow, base generally orange; stamens 3--5 mm; style 2--5 mm. Fruit: generally curved < 180°, 8--28(34) mm, 1.5--3.5 mm wide, obconic. Seed: 1--1.5 mm, irregular-rounded to -angular above mid-fruit, ×-section occasionally triangular with grooves along longitudinal edges below mid-fruit; tan, dark-mottled, to black; seed coat cells pointed or domed, in age > 1/2 tall as wide on seed surface edges. Chromosomes: 2n=54,72. Ecology: Sand dunes, gravel fans, washes, creosote-bush scrub, pinyon/juniper woodland; Elevation: < 2300 m. Bioregional Distribution: Teh, SnGb, SnBr, GB, D; Distribution Outside California: to British Columbia, Nebraska, Baja California. Flowering Time: Mar--Jul Note: Intergrades with Mentzelia montana, Mentzelia obscura, Mentzelia veatchiana. If recognized taxonomically, plants with n=27 assignable to Mentzelia californica H.J. Thomps. & J.E. Roberts or Mentzelia mojavensis H.J. Thomps. & J.E. Roberts. 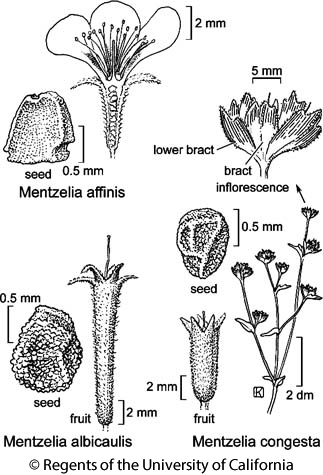 Citation for this treatment: Joshua M. Brokaw, John J. Schenk & Barry Prigge 2012, Mentzelia albicaulis, in Jepson Flora Project (eds.) Jepson eFlora, http://ucjeps.berkeley.edu/eflora/eflora_display.php?tid=33221, accessed on April 19, 2019. Teh, SnGb, SnBr, GB, D; Markers link to CCH specimen records. Yellow markers indicate records that may provide evidence for eFlora range revision or may have georeferencing or identification issues. Purple markers indicate specimens collected from a garden, greenhouse, or other non-wild location.